The 2̶0̶1̶6̶ ̶M̶o̶n̶o̶c̶a̶c̶y̶ ̶R̶i̶v̶e̶r̶ ̶M̶a̶n̶a̶g̶e̶m̶e̶n̶t̶ ̶P̶l̶a̶n̶ Monocacy River Land Grab being perpetuated by Frederick County Executive Jan Gardner has been gaining some attention from local organizations. 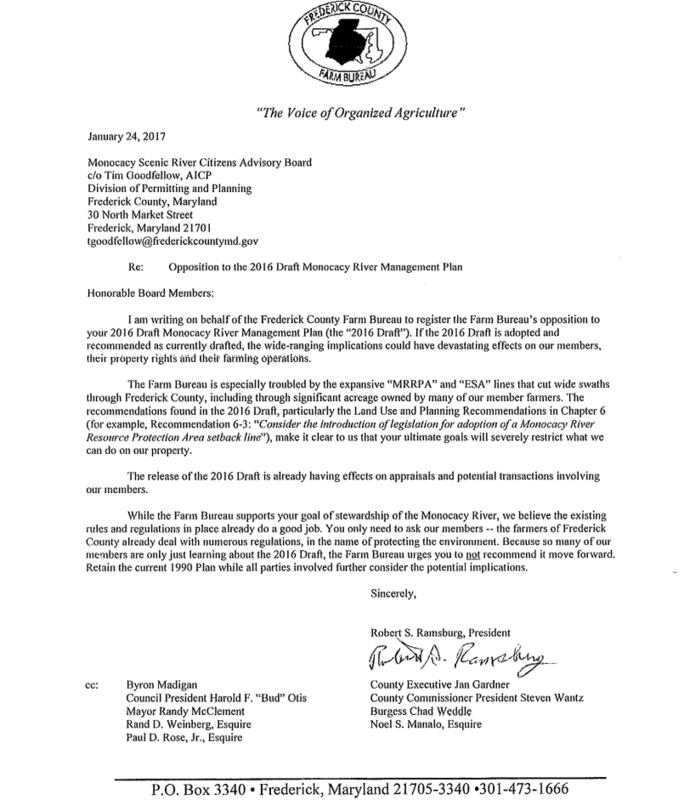 On Tuesday, the Frederick County Farm Bureau sent out a letter to the Advisory Board and every elected representative that will be part of the decision making process. The Farm Bureau is not pulling any punches on this issue. In the letter, they cite property rights infringements and disruption to farming operations. On Wednesday, I had two property owners along the Monocacy River which echoed these sentiments. You can listen to that episode of Thor at Four in it’s entirety here. Rocky Macintosh of MacRo Real Estate has also published an informative look at the plan in depth. I have been informed of a few conversations with interested parties, specifically County Executive Jan Gardner. Please stop misinforming people and do your homework. As I advised you previously, I do not have the authority to issue an executive order to stop the work of the River Board. The Monocacy River Scenic Advisory Board is created under state law. The Secretary of Natural Resources administers the program. Because this is a State program, I do not have any authority to stop or end the work of the River Board. State law has also defined the makeup of the board. This information can be verified with county legal staff and was referenced in an email sent last week by County Attorney John Mathias. Continually and intentionally misleading and misinforming people who have legitimate concerns about this proposal and this process is a disservice to everyone involved. If you want to make suggestions or assertions, please make sure you know what you are telling people is accurate before you make the statements. First off, County Executive seems to be using a private e-mail address to conduct County business. Out of professional courtesy, I blacked out half of the Gmail address that CE Gardner is using. I sure hope that these e-mails are being properly archived and accessible to the public in accordance with the Maryland Public Information Act. Second, CE Gardner states that she does not have the ability to issue an Executive Order to stop the Monocacy River Land Grab from being put into affect. This statement does not pass the smell test. For anyone that has been following Frederick’s Charter Government experiment, we all know about that one time that CE Gardner used an Executive Order to override an ethics commission ruling. Which one? The ruling that WF Delauter and Sons would be able to bid on County contracts. This ethics ruling was issued at the same that that the commission determined that the two teachers, Councilman Jerry Donald and Councilwoman Jessica Fitzwater, would be allowed to vote on Board of Education budgeting. As demonstrated by past actions, County Executive has the ability to stop the Monocacy River Land Grab, or should we say #Monoca-Gate, in it’s tracks. There are two explanations for these actions. Either County Executive Gardner has a new love and appreciation for Executive restraint, or she wants to use environmental regulations to illegally confiscate private property.I have a filed a series of PIA requests related to the Monocacy River Land Grab deliberations. If the pattern continues, the County will wait until exactly day 30 to actually respond to these simple questions. Let me tell you, dealing with the County on PIA requests make me appreciate the efficiency of City Administrator Carrie Myers here in Brunswick.